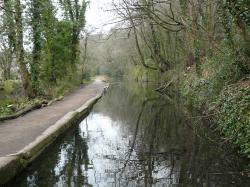 The Glamorgan Canal first opened in 1794 and was built to transport iron goods from the iron works at Merthyr Tydfil to the coast for loading onto ships. By the 1830s there were two hundred barges on the canal mostly carrying iron and coal. Although only twenty-five miles long, there were fifty-one locks to negotiate and the journey from Merthyr to Cardiff could not be done in less than twenty hours. All along the route there were men and boys and womenfolk: passenger barges, horses, towing ropes, farriers and stablemen: lock-keepers eager to exchange a few potatoes for a little coal to warm their cottages: victuallers, opportunists and hangers-on: and urchins throwing stones at all and sundry. Alongside the canal banks were works of every kind. Two miles north of Cardiff, at Whitchurch, were the Melin Griffith tin plate works. A mile or two further on, at Pentyrch, were a large number of iron foundries and forges. At Nantgarw came the china and porcelain works and the first of the coalfields. The smoke and the sweat and the sheer industry of all these comings and goings would have made a scene that can now only be imagined. And not only did the canal carry the iron and coal from the valleys to the sea, but it served well in the other direction, taking the fruits of the sea into the hills. And not always within the law because smuggling was still rife in the Bristol Channel and the canal was a useful means of distribution. In 1818 a large shipment of spirits was landed at Barry Island, then still a separate island and a known haunt of smuggling gangs. The preventative men managed to seize three kegs but most of it found its way to the drinking dens of Cardiff and onto the canal barges to smooth the palette of many a coal miner and foundry worker. A small number of canal constables were appointed to keep order and help prevent pilfering. Constable Thomas Spencer was stationed at Nantgarw and rented a small cottage in the village with his wife Elizabeth. But even the canal police were sometimes involved in the rough and tumble of the day. In 1859, Constable George Callaghan, who served in the Glamorgan Canal Police alongside his brother, Thomas, charged an ex-constable named Parkinson with assault after he was beaten about the head on the canal bank. As the 19th century wore on and coal began to be extracted in quantity, it became clear that the canal was not going to be able to handle all the increased trade. The problem of improving the movement of coal was resolved by the ironmasters at Merthyr when they conceived and built the Taff Vale Railway which opened in 1841. The era of the railways had arrived and it would be as much an improvement over the canal, as the waterway itself had been over the packhorse and wagon routes fifty years earlier. The canal continued to be useful into the 20th century but it was always in decline. In 1882 it was sold to the Bute Dock Company and in turn was passed on to the Great Western Railway in 1922. It was sold to Cardiff Corporation in 1944 and was progressively filled in from then on. The only significant sign of it’s existence now is a half mile stretch of water in Whitchurch, Cardiff. There are no records of the Glamorgan Canal Police and no indication of when the force was formed or ceased to function. From 1882 onwards any policing requirements would have been undertaken by the Bute Dock Police. Constable John Thomas March 1854 Cardiff & Merthyr Guardian Report.